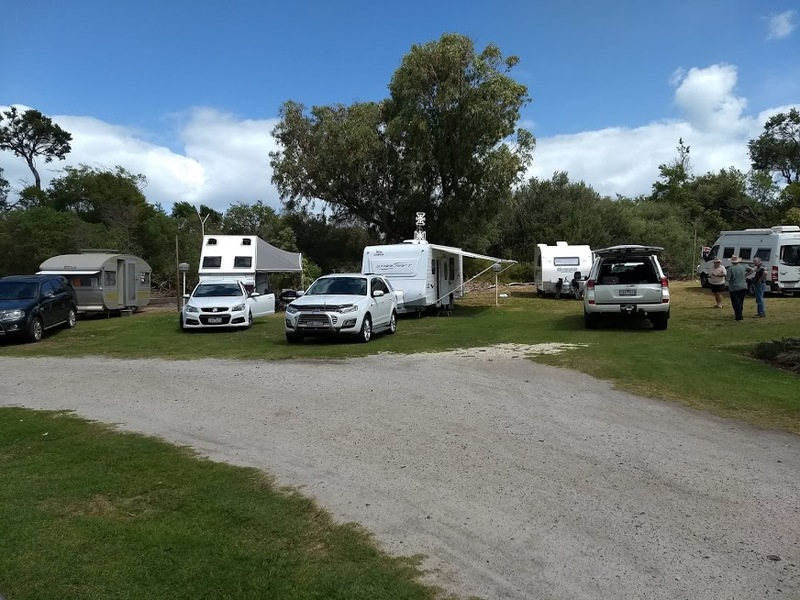 Inverloch Foreshore Caravan Park was the venue for our first GCCSR caravan owners weekend away and the weather was perfect. 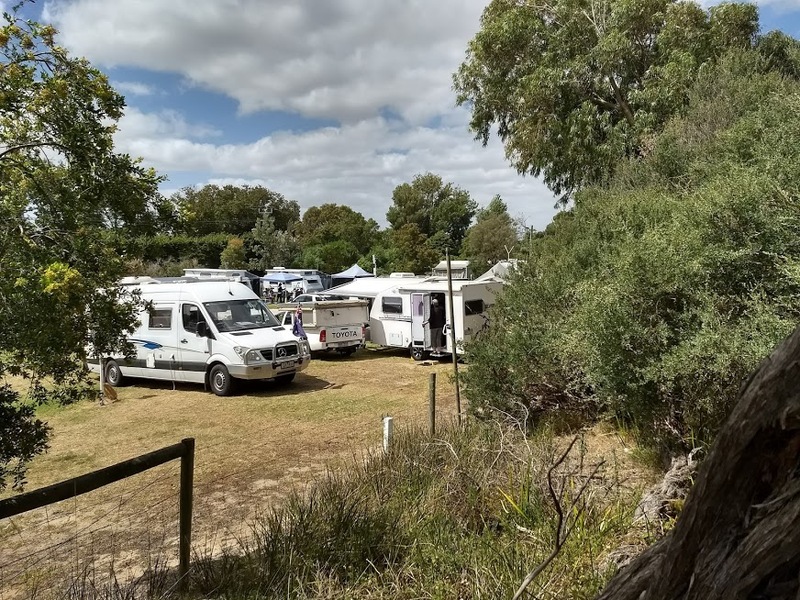 Participants were Karl Lintzen and Lyn Fox, Rolly Ruck, and Graham and Elaine Longhurst all representing the motor-home brigade. Caravaners were Jean and Phil Finger, Lorraine and Allan Richards, Denise and Brian Jolley, and John Fowler in his recently acquired 1967 retro caravan which he intends to tow to rallies behind his 1947 Dodge truck. Bill and Judy Aitken, and Bob and Rhonda Russell completed the roll up. Happy hour each afternoon was a lot of fun with much laughter and conversation partly as expected about caravans and the pros and cons of caravans verses motor homes, but don’t worry dear members, the all-consuming subject of cars was never far below the surface. 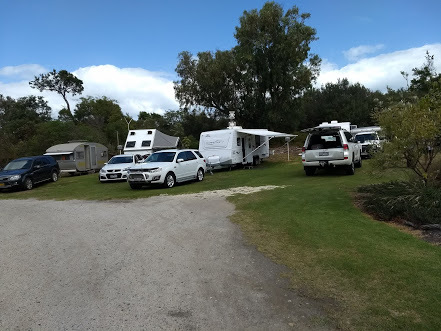 We completed our weekend with a Buffet Lunch at the Inverloch RACV resort, where we were joined by Ron and Trish Brooks who have also recently purchased a camper trailer. A big thanks to Jean Finger for organising a fun weekend. The following 8 caravaners attended and arrived at varying times on Friday, although I think someone arrived on Thursday (Bob & Rhonda?). Participants included Jean & Phil Finger, Allan & Lorraine Richards, John Fowler, Bob & Rhonda Russell, Bill & Judy Aitken, Graham & Elaine Longhurst, Brian and Denise Jolly, Lynn Fox & Karl Lintzen. Karl & Lynn arrived late Friday night after sorting out an unexpected taxi problem. I travelled over the hills from Darnum and arrived and set up on the foreshore camp ground just before lunch on Friday. 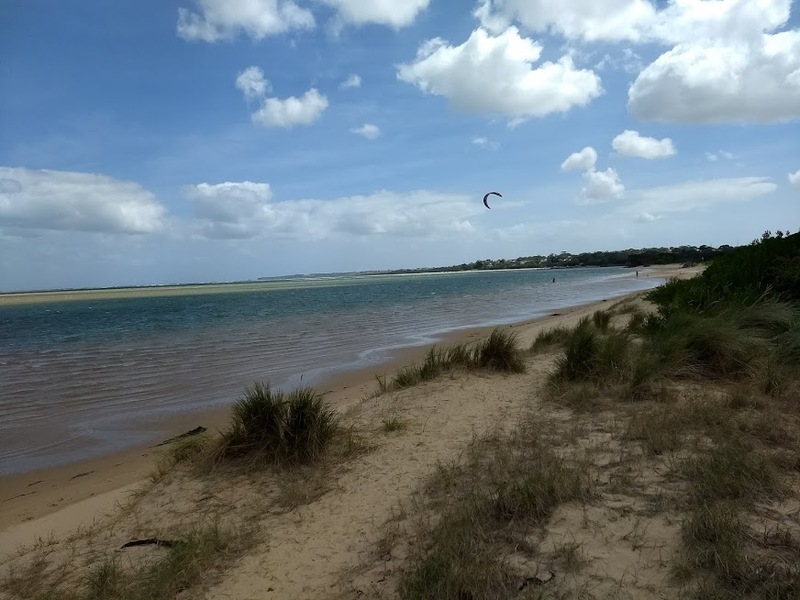 Later I went for a drive around Inverloch to explore the town, and it was very busy. 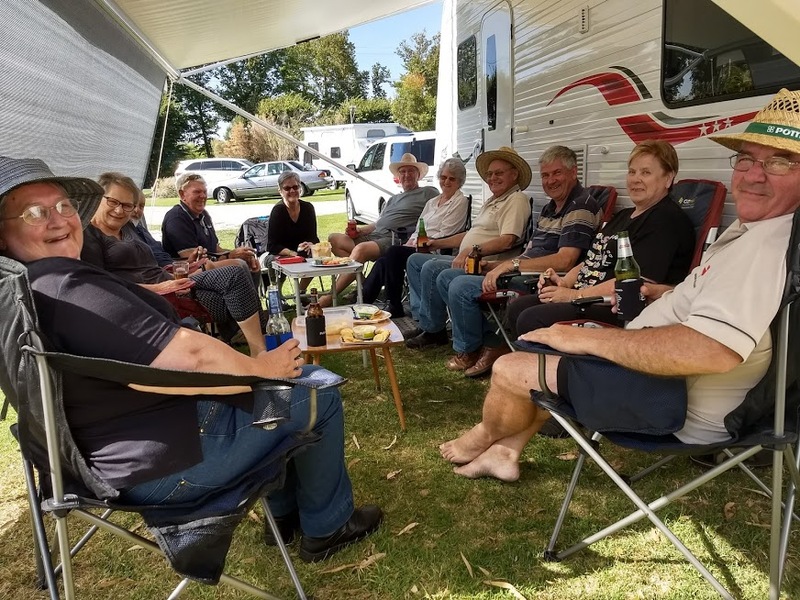 By early Friday arvo’ everyone seemed to be set up – up against the tea trees of the sand dunes – and it was decided to later have a Happy Hour at 4pm under the annex of Allan and Lorraine’s caravan. The annex was needed because the sun was quite warm and there was very little wind. However, the other side of the tea-trees and the sand dune, it was very windy and blowing straight in onto the beach. Many went for a stroll along the beach as the tide was well out, we also moved around looking at the various vans and chatted. After dinner we wandered around and chatted for a bit and had a cuppa, before wandering off to our respective caravans for a fairly early night’s sleep. 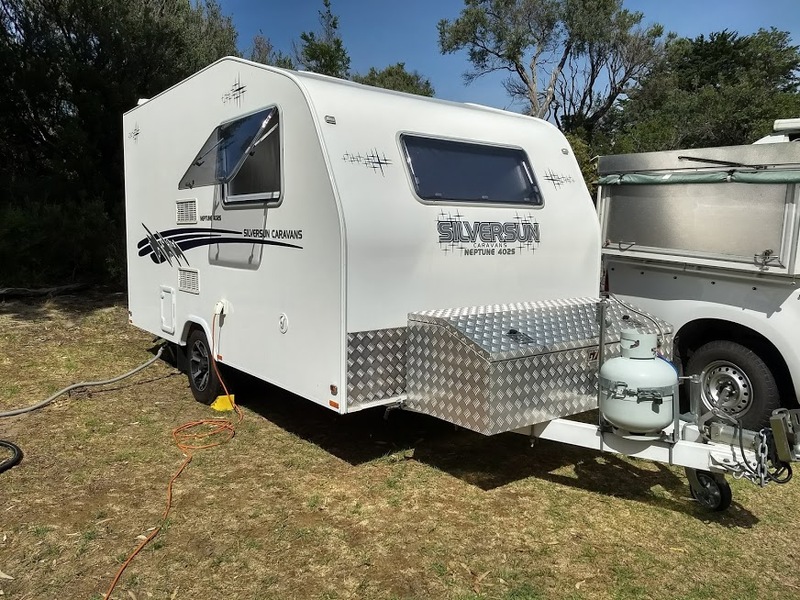 For me it was still a new experience, as I had only been away in my newly-purchased 1967 Hillandale 13’6” caravan twice overnight before to Truck Shows behind my ’47 Dodge truck. I am the second owner, having bought it from the 95 year-old owner in August last year. It had been sitting under a semi-enclosed carport and unused for at least the last 15 years, and it was still in good and all-original condition – a time warp, but very basic by today’s standards. It was a cold night, and as I have found out, these early caravans do not have any insulation in them! I later remembered that I should have closed the roof hatch too. I know that the others in their late-model ‘vans, had no such problem, especially with all their mod-cons, almost a normal home away from home! Over the weekend, I found it fascinating to look at all the various sizes and layouts of these alternative homes – all with some amazing features. We had small, medium and quite large ‘vans, off-road ‘vans, an ‘A’ Van, a ‘Slide-on’, and a converted bus. 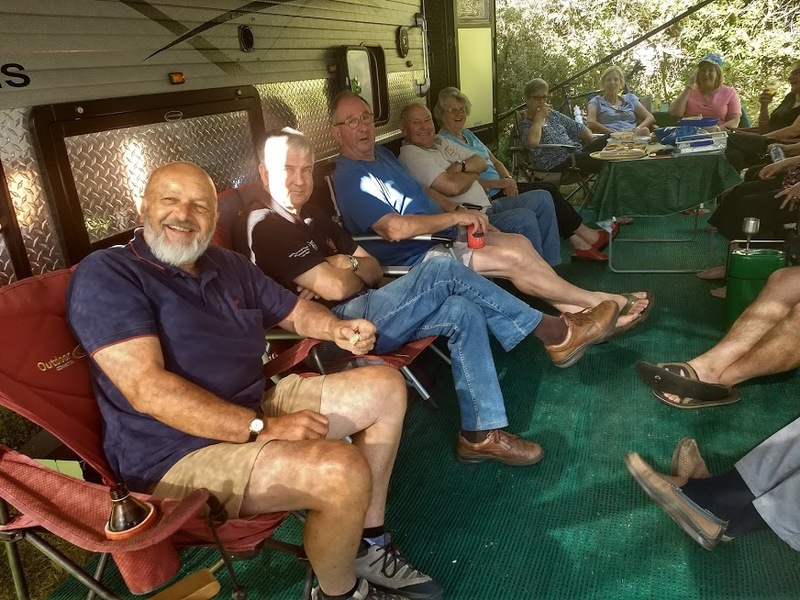 For this Club event, it was not about the cars, but about the ‘vans and socialising. Saturday morning was another warm sunny start and after breakfast we wandered around and enjoyed each others company, before many either undid their bikes from the back of their ‘vans or unfolded their collapsible bikes from inside their ‘vans and went off for a ride together. 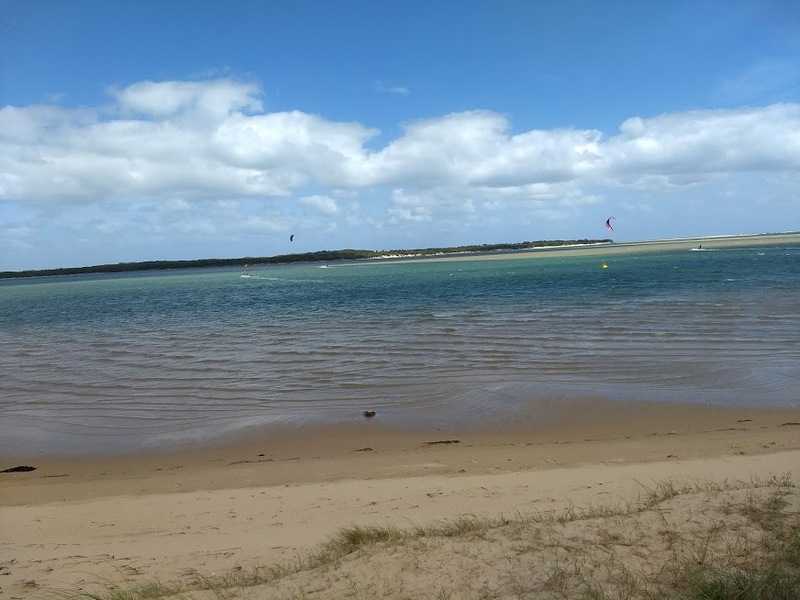 I drove into Inverloch again for some supplies and a further wander around before lunch. 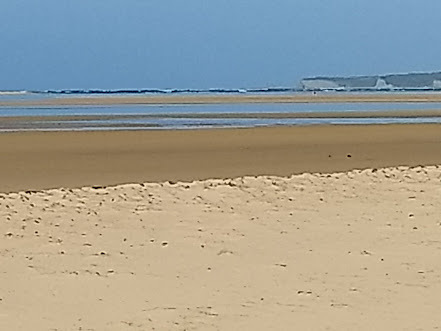 After lunch and back at the camp ground, I went for a walk further up the foreshore behind the sand-dunes to the board-walk which the bike riders had mentioned. This covered the swamps and led to a bridge across a wide creek, after which it branched off to the Bluff or inland along the creek to various fishing spots. A wonderful wilderness walk. Back at the campground, some considered going for a swim, but the cool wind still blowing onto the beach soon had people cooling to that idea. Instead we just enjoyed watching the wind-surfers and the ski-boarders being pulled along by their parachutes and marvelled at their turning and manoeuvrability. 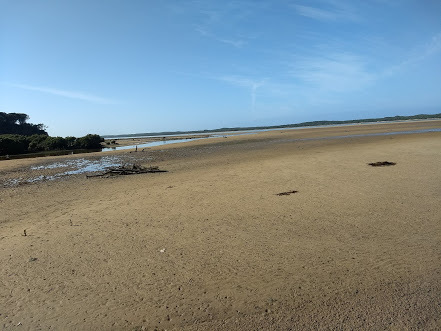 The tide was rapidly going out and exposed the long shallow sand-bars ideal for walking on, and in fact fishermen had gone way across them to fish in the far channel. Over head we noticed a group of motorised para-gliders fly over us to the far shore of Andersons Inlet and Venus Bay with what looked like fishing rods strapped to their trikes. We guessed they may have been going for a surf-fish. 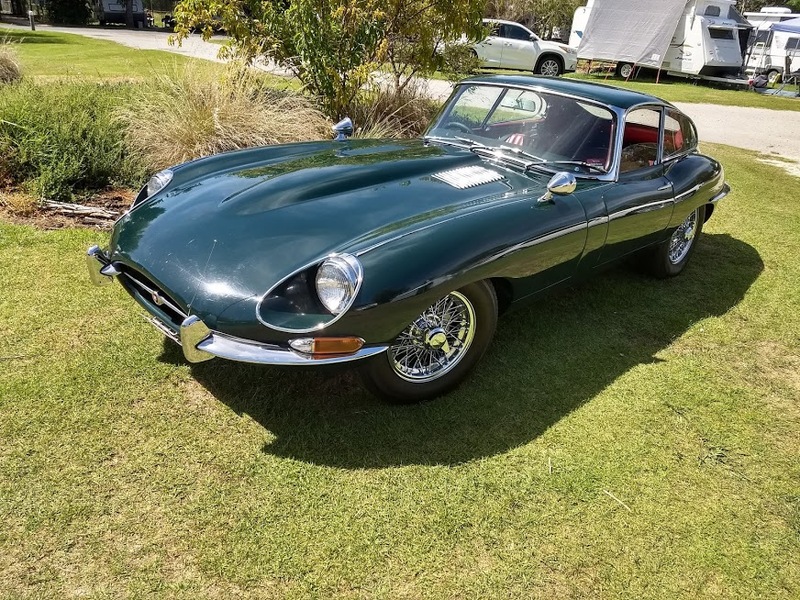 Cliff & Tinika (ex-members) arrived from near Korumburra in their wonderful dark green Jaguar E-Type coupe that Cliff restored from an imported ‘basket-case’ over a period of a couple of years. A real credit to him. He has had a very large number of cars over the years, so we wondered if he would be keeping this one? 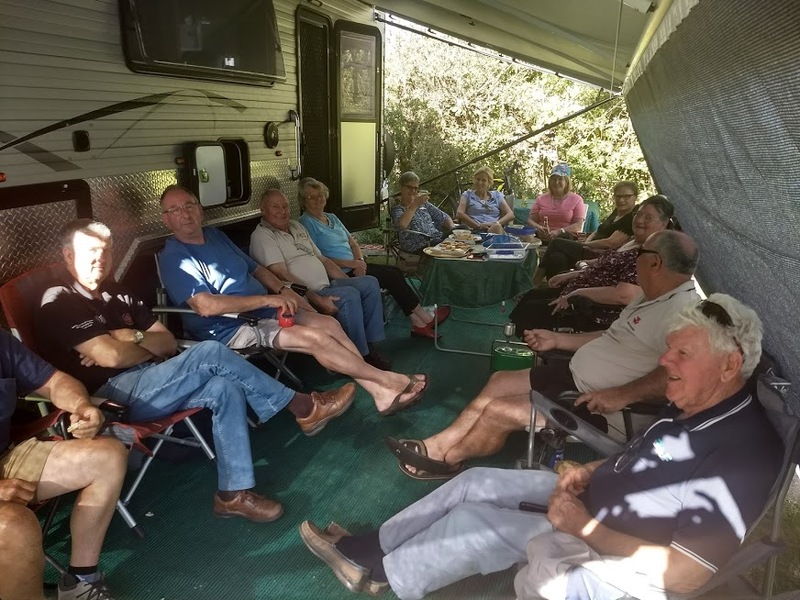 Some more socialising and moving between ‘vans followed before we wandered off to Bob & Rhonda’s ‘van for Happy Hour under their large annex. A great variety of cheeses, dips, plates of assorted nibblies, bikkies and chips had been prepared by everyone – very tasty! Many topics were covered with great authority, augmented with some cleansing ales or stimulating wines! The happy chatter continued, and it was all very enjoyable and lasted until after 6pm once again before we dispersed to make our respective dinners. After dinner, we once again wandered around, chatted and had supper before retiring for the night. Once again it was quite a cool night and the thick doona was required in the old van, but this time I remembered to close the roof hatch which made a bit of a difference! Next morning, everyone was saying what a great relaxing and friendly experience it had been. It seemed that everyone thought that we should do this again soon, and Cowwarr Weir was mentioned as one possibility. After more chatting and beach walking etc, we all gradually packed up ready to move out before lunch (as required). Some had elected to stay an extra night. 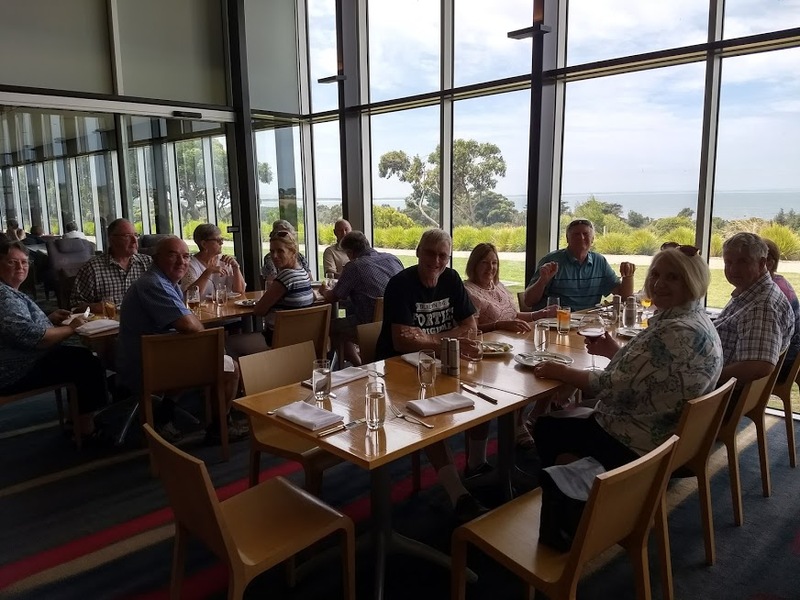 Most of us then went down the road to the RACV Inverloch Resort for a $42.50 buffet lunch. The parking with a caravan in tow was a bit tight, but we managed OK. The views out over the ocean were spectacular and the service was excellent. Some remarked that it was strange that the large array of dishes were not labelled. You could return to try the various dishes as many times as you liked. Most of the main options were excellent, and the dessert options were delightful, and we could finish off with tea or coffee. From here, most of us then travelled home. Thank you to Jean and Phil for organising this most relaxing and social weekend! We all wished that Steve had a caravan so he could join in with us too! Perhaps he could hire one for next time?